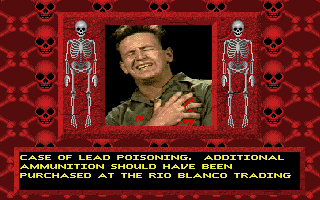 After dealing with Tony Martin and the deadly piranhas, I'd arrived at Rio Blanco. El Loco, a giant bully in a yellow shirt, sits lazily in front of the hotel and won't let me in. I expect I'll have to get rid of him somehow seeing as he's the title of the episode. Other things of note in this village are a cantina, a small trader's shack, a well, an abandoned church that I don't seem to be able to interact with and a small canoe. I can sense I'll be on the canoe in future, but look at the other areas first. I take some extremely spicy cayenne peppers from a cart, and look at the small trader's stall. There looks to be lots of potentially useful items here. I almost KNOW I'll be needing this item at least. Unfortunately when I try to take stuff, I'm told that I don't have enough money. 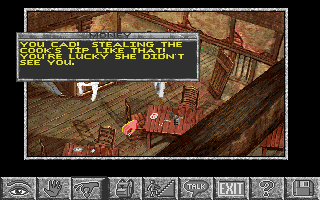 I check my inventory and notice that the cash I took from Allen's safe is gone – perhaps it got wet and floated away in the plane – anyway, without the ability to make a purchase, and as I also seem unable to enter the church, I check out the cantina instead. A lot of people are in the bar, but most of them won't talk to me. The cook will, and is helpful. But she speaks English with a very American accent which doesn't seem right for the location. Got it – so I need to pretend I'm a god! She tells me that El Loco eats a lot and while I'm in the cantina she's constantly making meals which a boy picks up and then, if I go outside, I see him take the meal to El Loco, then he comes back, repeating the process. I decide to spice up El Loco's next meal with my cayenne peppers, and am told that he'll notice them unless I hide them in the food. Looking around more carefully I notice a knife on the bar. I wait until the cook turns her back, then take her knife. I combine the knife and peppers in my inventory, wait for her to turn her back again and put the chopped peppers in his meal. After the boy picks up the newly spiced meal, I go outside and watch him give it to El Loco. El Loco does not like his chicken spicy! 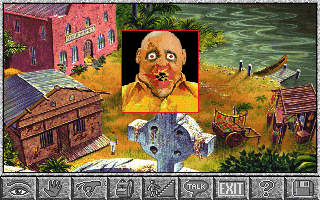 El Loco runs to the well and starts drinking, so I enter the hotel he'd been guarding. Inside the hotel I find a payphone, a rattrap, a rat hole and a rat that occasionally runs down the stairs to his hole. I take the trap and check out the hole. Well, hopefully I won't be needing an index finger for the rest of the game. I don't think the rat actually ate my finger seeing as I don't get a game over screen or die of rabies. Seeing as the most likely place to find rattrap bait is the cantina, I go back there. Some of the patrons that were there before have left, and one of them hadn't finished his cheese enchilada, so I take it. Gee, twenty years in jail for stealing somebody's leftover food that would have been thrown out anyway – seems a bit harsh. Anyway, waiting until the cook's back is turned, I take the cheese enchilada and use it with my rattrap. I then go back to the hotel and put my loaded trap on the stairs. The rat hits it, dies (that's for biting my finger, pal!) and I empty out his rathouse. Is 300 pesos a lot? I'm going to assume that's a lot. My pesos are all in paper form so I still can't use the phone, but again checking out the cantina and looking more carefully next to the enchilada remains, I see some peso coins. After spending twenty years in jail for stealing garbage I'd hate to see what I got for actually stealing money! I use my peso coins with the hotel phone and dial 'the number'. I wasn't sure what number I was dialing, but I'm sure it's important. The phone rang a few times, but nobody answered. Then I had the vague recollection of having to let it ring a certain number of times. Checking my old screenshots confirmed that Allen told me I'd have to call a number and let it ring three times. I did that, then hung up and went back to the cantina. After a few seconds, a woman arrived. I speak to her, and one of my two options always mentions Allen and makes me seem keen. I don't know anything about this woman yet, and don't want to give away my identity so I ignore those and tell her I have questions of my own. Shouldn't you have said 'Hasta La Vista, Baby'. Reloading, I excitedly ask about Allen instead of caring about who she is. She then gives me a small questionnaire. I failed her test the first time. I didn't have a screenshot of me looking at inconsequential items, so I reloaded to a much earlier save and looked at the trophies in my apartment. Allen's stock car trophies were won in 1952. I looked at other things and kept them in my mind so I could pass her stupid test. She tells me she'll take me to Allen, so I leave. Outside the cantina I now see El Loco punching the boy who delivers his food. I can get in a canoe and leave, that's what I can do. That all costs 280 pesos so I assume I have 20 pesos left. 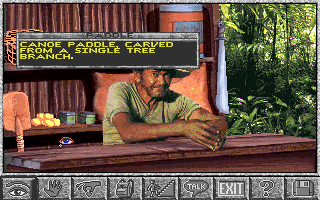 I climb onto the canoe, and we get a narrated text screen telling me what happens next. Maya takes me to a hut next to the river. In the hut, I find my injured brother. So, during the entire canoe and walking trip you never told me your name. Must have been a pleasant journey. Maya had found Allen near death and nursed him back to health. Allen told me the lengthy story of his expedition. Part of the story was told from his point of view over the opening cutscene, which was quite cool. I assume the Director's notes for Allen's speech was, "say it with the same emotion you'd have if you were reading random names from a phone book, and also as if you're reading it now for the first time – ACTION!" So, you were just pretending to be asleep while all your friends died around you. 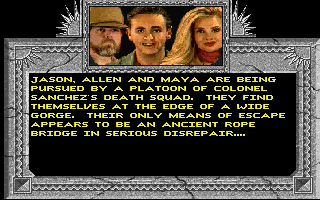 Brave work, Allen. Brave indeed. But before I left the tent, I put on my much brighter blue jeans. We give Allen a few more days to get well enough to continue looking, then walked through the jungle. We continue walking until we find an old decrepit bridge. As we approach, we hear gunfire and find Sanchez' men coming at us. Seems mighty heroic of you, Allen. Why do I get the feeling you'll die as soon as the rest of us are safe? 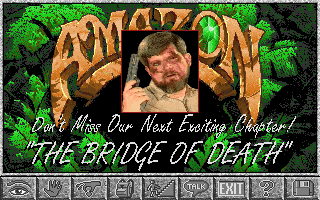 We start the chapter with Allen shooting while Maya and I stand near one end of the bridge. 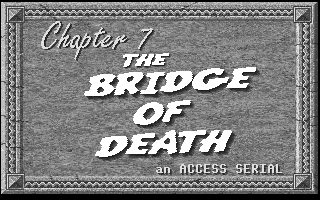 Sensing danger (the chapter's called The Bridge of Death, of course I sense danger,) I look around before attempting to cross the bridge. Seems I don't have time to look around. 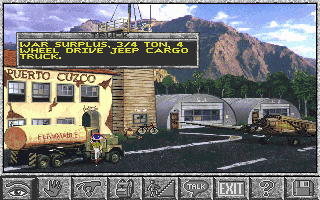 Reloading, I find the obvious item, a sheet of corrugated iron, sitting next to the bridge. I move it. Allen alternately shoots, then ducks behind the corrugated iron! Side note: Corrugated iron is such an important part of Australian history that it had a major part in Sydney's Olympic Opening Ceremony in 2000. 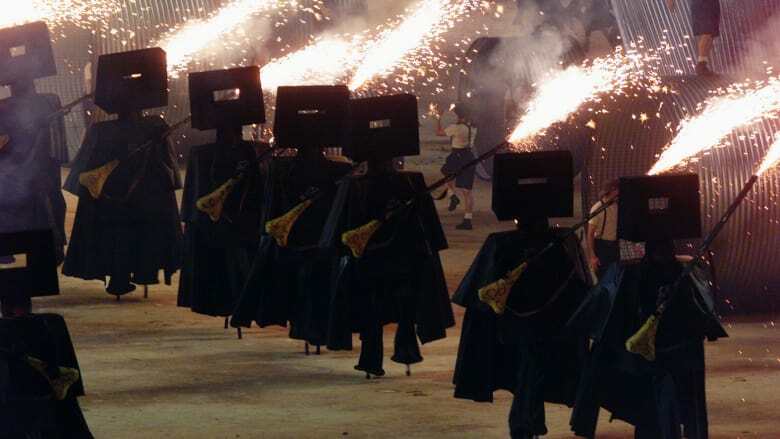 Another Side note: Olympic opening ceremonies are weird! At least it's nice of the death scene to tell me what I should have bought a chapter ago. This is like a much less funny version of the babel fish puzzle from Hitch Hiker's Guide to the Galaxy. Oh well, I'll just forget about looking around, quickly set up our iron shield, give Allen some ammo, then walk across the bridge straight away. Okay, so maybe I do need to take time to look around. Looking around more carefully I also find a log, which can be used as a support beam for my corrugated iron. Let's try again. Move the iron, move the log, give the ammo. Now, so I don't fall, I have the clever idea of using my fishing net to stabilize the bridge. I just have to find the right spot. Um... game... I'm standing on the bridge. How close do I have to be? I die various ways in this section trying to get closer to wherever the game thinks the bridge is, all so I can try using inventory objects on it. At some point I discover that the middle of the bridge gets a different description, and is labelled BREAK. Aah. Let's try again. Reload, move iron, move log, give ammo to Allen, get vine, cross bridge. Use vine on bridge. I'm at least a third of the way across – HOW CLOSE DO YOU WANT ME? I try doing stuff in this area for a long time. Eventually, I determine that I needed an item I didn't have. I know I have everything from before Chapter 6, because the hints I got at the end of the last post mentioned an item in Chapter 4. So I went back to earlier in Chapter 6 and looked around more carefully for something that might help me cross a bridge. How did I not notice this ladder earlier? Checking out my previous screenshots, I know why I didn't notice the ladder earlier – it wasn't there most of the time – it didn't appear until after I spoke to Maya – and after I spoke to Maya I just bought some stuff and got in her canoe - I hate you for that, game! And I hate that walking around this screen, particularly vertically, takes an annoyingly long time. Then I noticed something. I had been very unobservant! At the top left of the screen in the bridge section was a small picture of Jason, and there was a small picture of Maya at the top right. I clicked on the picture of Maya and could now control her instead. Yes. I'm an idiot. 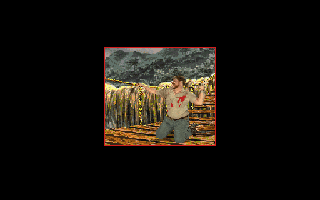 And yes, I checked the manual afterwards and the icons for controlling Jason/Maya were mentioned there. But, a tip for any game makers - try not to have the first instance of a new interface feature also be a rushed timed sequence - give the player a chance to get used to it in a previous relaxed screen first. 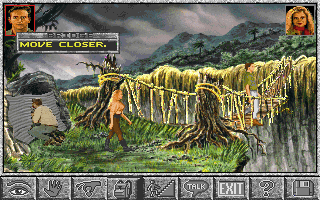 Anyway, I easily walked Maya onto the bridge because she's lighter than Jason, and used the vine on the break to fix it. Now it should be stable enough for the men to cross. 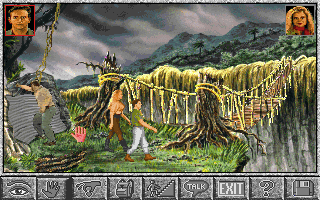 Before Allen dies, he cuts the rope with his machete so the bridge collapses and we won't be followed. Then we get one of the funniest examples of bad acting I've ever seen in a game. I think it's even funnier if you just look at Jason the whole time as he waits for his cue to say his line. With Allen dead, Jason wonders for a moment if he should now just give up and go home, but quickly determines that he needs to continue so Allen's sacrifice isn't in vain. 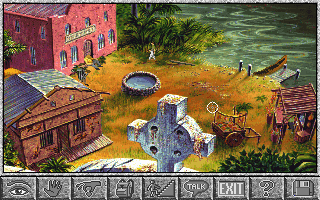 Jason's next location is marked on Allen's map – the name of Hans Stroheim has been noted next to the village of Tefe. I'm now standing in front of a boat, The Amazon Queen, looking at its captain and first mate. 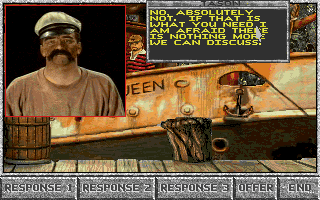 I talk to the captain, and after going through some dialogue options, offer him some cigarettes as payment for my passage to Tefe. What else? Are you serious? I already reloaded to Chapter 4 to get the cigarettes! I look at what else I have in my inventory that he might like. I offer him my ladder, machete and cayenne peppers. I offer him Jason's car keys, the map... every single thing I have. And it's annoyingly time-consuming to do so, as I have to restart the conversation and listen to his greeting every time I want to offer him something different. Hey, didn't you used to be one of the Village People? Looking around, there's not much I can do here. 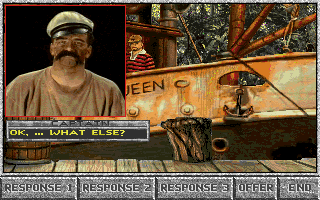 The cargo, boat, captain, first mate, jungle and stump are the only things I see and I try interacting with them all but can't find anything to do but talk to the captain. 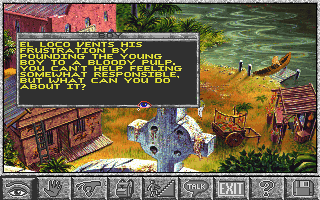 Some of his dialogue options suggest that something else might count as payment. 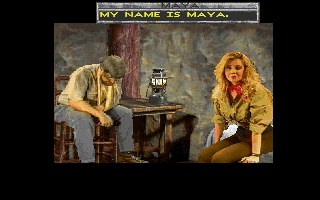 Look, I've spent so long in this chapter, I'm willing to do anything – how about you, Maya? Let her speak for herself, Jason. If I can't think of anything to do, you'll be standing right here forever so maybe you should look at all options. 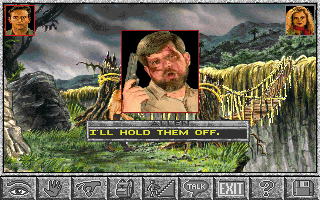 I once again reload to the village of Rio Blanco, wondering if I'd missed anything else. I did – I find a wooden pole outside, take more of the leftover enchilada and a lighter on one of the other tables in the cantina – a lighter! The captain wanted something other than cigarettes, so of course he was referring to something to light those cigarettes. 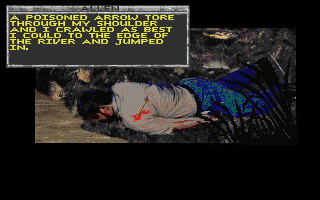 I play the rest of Chapters 6 and 7 again – through Allen's long cutscene, through the Bridge of Reloading (a few times, because I took too long to do stuff), watching Allen die. 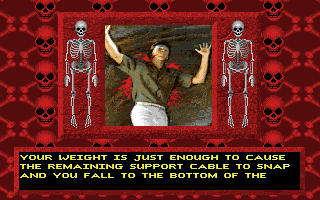 (he's cutting the support rope - Nooooooo!) And finally, I'm back at the Amazon Queen and can offer the boat captain a lighter as well as the cigarettes. So, I'm stuck. I don't know what Captain South America wants. Or at least, I don't have what he wants. 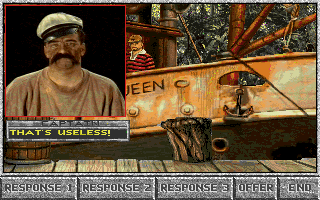 I thought perhaps I'd spent too much money on trading shack items and could buy less and still have some cash, but on reloading realised I had cash when I left town but it disappeared some time before I arrived at the Bridge of Frustration. I took 300 pesos from the rathole and only spent 280 at the store so should have still had 20 pesos. Maybe Jason ate the money to keep himself awake during Allen's boringly told story – at least Jason only had to listen to it once – I had to put up with it four times. 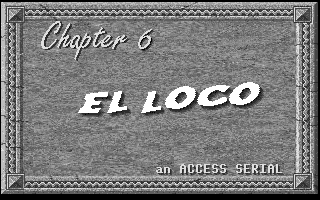 Perhaps there was something I should have done to rescue the boy from El Loco's misplaced wrath. I tried talking to them or giving them things, but it didn't seem to work. I also tried every single combination of dialogue options (there were 16) with the Captain and didn't find one that worked. And so here I am, requesting assistance. As always, hints should be encoded in ROT13, starting with very vague hints, then getting gradually more detailed. Much like Voltgloss' hints in the last play post. Thanks in advance. I'm looking forward to getting out of this seemingly endless Chapter! 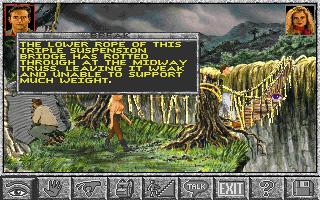 Items picked up after reloading old saved games: 6 - Cigarettes, Ladder, Peppers, Cheese (enchilada), Lighter, Small pole. 2) Fbzrbar arrqf lbhe uryc. Thank you, Alex. I'm now finally in chapter 8 after reading your second hint. I really should have thought of that - I think my frustration made me lazy as I stopped trying to help the boy after a few attempts. To be fair, I love this game, but for nostalgia reasons probably. Wow. 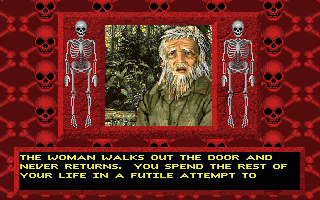 I never played this game at the time, and can tell that I would have given up much earlier than you and just resorted to a walkthru to get something out of the game. Much like a soldier, thank you for your sacrifice in playing this rather poorly-designed game for us. Oh. I'm the same. 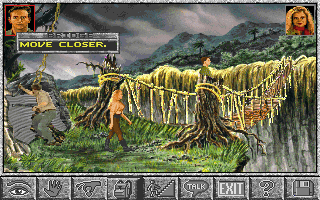 If I was just playing this game for fun I would have looked online for hints at some point before realising I could have switched to Maya to get across the bridge. I've been enjoying the game in general, but Chapter 7 frustrated me from start to finish. Well, the concept is certainly appealing, and it wants to take itself "tongue-in-cheek", but the execution seems to have missed the mark. Different writers or a better publisher, perhaps this would be a different story. "How did I not notice this ladder earlier?" Well, since you can put it in your back pocket, it must be a small ladder and therefore easy to miss. Maybe it's a single-rung ladder. Hehe. 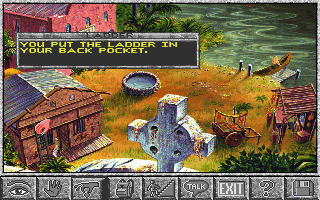 I think when you become an adventure game protagonist you're given some infinitely big pockets - unless you're in an Infocom game, then you have to find a place you can easily get back to to drop all your stuff.